Nan Dixon » It’s Release day for THE OTHER TWIN! 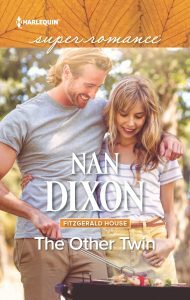 It’s Release day for THE OTHER TWIN! Happy New Year! THE OTHER TWIN has lift off! Here’s a little bit about the book. If you’ve been reading the series, you should recognize the hero and heroine. I had a lot of fun writing Cheryl and Nathan’s story. Who c an resist a neighbor in need? I had a blast writing the two kids in the story, even if Josh ended up being a bit of a brat. And poor Issy has a lot of mother issues. To celebrate the release of the 4th book in the FITZGERALD HOUSE series, I’m giving away a $25 Gift Card. Just tell me you’re favorite kids story, either your own–or kids that you know. Make sure you double click to to get the comment box.